If anyone deserves a special, thoughtful, and straight from the heart engagement, it’s a teacher. They are some of the most giving, selfless, and hard-working professionals out there, who deserve to be loved and appreciated. 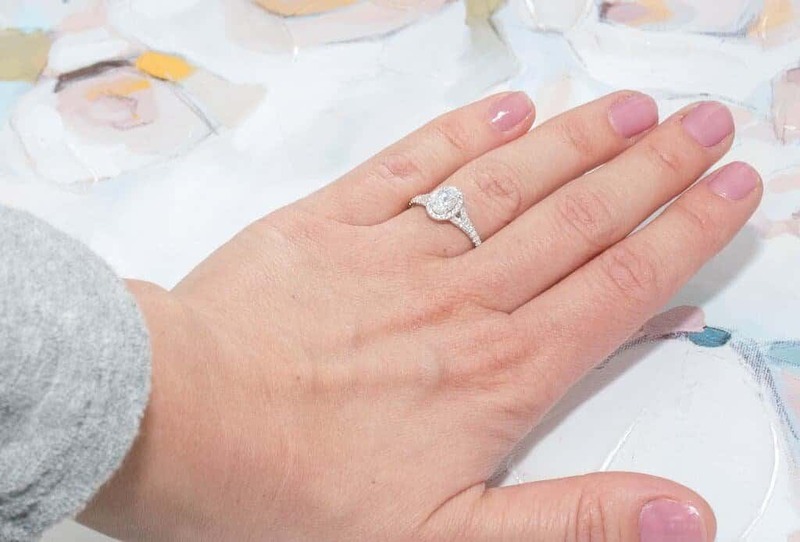 Before rushing out and purchasing just any engagement ring for a teacher, there are a couple of practical things to keep in mind. Teachers, especially those who work at the preschool or elementary level, work with their hands a lot, and are often exposed to sticky, gooey, messy substances throughout the day. Easy to clean rings with a smooth surface that won’t become easily snagged and entangled on the many miscellaneous items in a classroom are two important qualities to consider when ring shopping. Along with being beautiful and dainty, rose gold is more heat resistant and durable than yellow or white gold, making it a practical choice for any busy teacher constantly on the move. An open banded ring is much more breathable and more comfortable than a closed banded ring, making it a top contender for any teacher. An open band is also creative and stylish, making it the perfect piece for daily wear. Many popular rings, such as a knife-edge have a higher setting where the diamond protrudes high above the band, to better show off the diamond. However, for an active teacher, these could become a nuisance and a safety risk, as they may become caught or damaged if bumped against hard surfaces (think rows of wooden desks and tables for examples). Instead, consider a low-set diamond ring, which is still a beautiful choice, but is closer to the finger, making it a safer choice for those working near children. The Bezel setting eliminates the risk of snagging altogether, as there are no exposed or protruding prongs to worry about. Instead a ring of metal surrounds the diamond, keeping it securely in place and somewhat shielded from accidental bumps and bangs. This setting lessens the chance of the diamond becoming loose or dislodged during the hectic workday, making it a top choice for any teacher. If the teacher in your life isn’t afraid to break traditions, a fashionable set of eternity bands may be an excellent choice. These metal bands are a bit bold with diamonds or gemstones that go all around the band of the ring. Some teachers may appreciate the sentiment in the symbolic “never ending love” meaning that accompanies the eternity band. These rings don’t contain a large protruding diamond which can unintentionally scratch or injure a small, energetic, moving child, making the eternity band a safer choice for teachers interacting with young kids daily. Much like the name suggests, this ring has literal rows of diamonds, which are set flat against a solid band. While similar to the eternity band, this is also a bit of a nontraditional choice, but still beautiful and unique and perfect for the trendsetting teacher who is looking for something a bit outside of the box. With a row of sparkling diamonds held in place by a thin metal strip, versus prongs, this type of ring is also a practical choice for those looking for a more durable ring, that won’t become easily snagged and entangled into clothing. Not everyone is all about the bling, and for those who aren’t, they may appreciate a simple, solid coloured band. While these bold, strong bands are fully capable of standing alone, consider adding an engraved message to make it extra special. Perhaps the date you met each other, became an official couple, or your initials can transform a plain band into a symbolic, sentimental treasure.